Founded in 2002, Alnylam is a biopharmaceutical company committed to the translation of transformative medicines based on RNA interference (RNAi) technology. The company’s discovery platform and pipeline of investigational medicines include three programs in late-stage clinical development. With the use of real-world evidence (RWE) key to the development and commercialization of Alnylam’s products, Sonalee Agarwal, head of value and evidence strategy, tells Pharm Exec about RWE’s central role in the organization and its application to the rare and ultra-rare disease space. PE: Can you outline the role of real-world evidence in Alnylam’s activities and how has it evolved over the years? 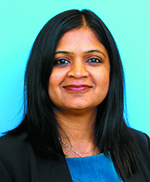 SONALEE AGARWAL: Given that our first three Alnylam-driven products—ONPATTRO (patisiran) for hATTR amyloidosis, givosiran for acute hepatic porphyrias, and lumasiran in primary hyperoxaluria 1—are Sonalee Agarwalin rare or ultra-rare diseases, we are currently using RWE to understand the unmet need, the disease burden, and the natural history of the disease, and we’ll be using it to see how the products perform in the real world. We tend to think about RWE as this new thing, but when I joined Alnylam two-and-a-half years ago, it was already an integral part of the organization. On our website, for example, we have a natural history study in acute hepatic porphyrias; this is an observational study that has patients documenting their experience with the disease, which is real-world data. RWE has long been at the core of our product strategy, all the way from Phase I, where possible, and certainly from Phase III clinical trials. In recent years, of course, the volume of medical information collected in digital formats has increased tremendously. The evolution of technological and statistical methods have given us a greater confidence in the inferences we make from these data sets. We are not doing causative studies with these data sets, but correlational studies. They give us hypotheses and an understanding of what is happening in the real world. PE: What do you look for in data scientists and analysts at Alnylam? AGARWAL: We look for people who are urgent, passionate, technically strong, and effective communicators. We are a science-based organization and we like to think about hypotheses, so not only do our analysts need to understand the data sets, but also understand the biases within them and effectively communicate what we are controlling for versus what we are not controlling for. In general, having past experience with big data sets is important and can help to establish clarity as we answer research questions. In my own experience, I worked with a large database, and I gained an understanding, for example, of what is clean data and what is not. I think that experience helps you understand the biases of the data sets and then overcome those biases to answer the right research questions. PE: What challenges remain for Alnylam in analyzing and understanding data? AGARWAL: The biggest challenge in answering research questions in rare diseases is that we need to find sufficient number of patients and the right data sources to answer the critical questions. On the technical and the statistical side, we have the tools for this, and if not, we collaborate with people who do. We use a variety of data sources, including patient surveys, claims data, electronic medical records (EMRs), and observational studies. It can be difficult because claims databases, for example, give us the volume, but not the granularity of data that we need. EMRs gives us more of the information we’re looking for, but not the volume. So, it’s not once-size-fits-all. It all depends on the disease, how robust the data is, and the questions you’re trying to answer. PE: How do you see Alnylam’s RWE strategy evolving over the next three to four years? AGARWAL: We’ll be using RWE throughout the product life cycle. Earlier in the life cycle, we use RWE to focus on defining unmet need and the burden of the disease, as well as design effective clinical trials. Post-approval, we will be using RWE data to better understand how the product performs in the real world and to understand the value of these medicines. RWE will continue to be a very important part of our core product strategy.